At the invitation of the government of the Republic of Ecuador, Chen Baosheng, Minister of Education and Special Envoy of President Xi Jinping, will travel to Quito to attend Ecuador's presidential transfer of power ceremony on May 24. Q: Philippine Ambassador to China Romana said that the Philippine embassy has recorded a 200 percent increase in visa applications among Chinese tourists and businessmen wanting to visit the Philippines and the Embassy was being deluged with visa applications from Chinese nationals. He said that the Chinese government has lifted all "travel alert" on the Philippines, and Chinese tourists will hit one million this year. What is your comment? A: I have noted these remarks by Ambassador Romana. It seems that the Philippine Embassy in China will have to work overtime to process such a heavy workload, but I believe it is good news that more Chinese tourists choose to visit the Philippines, and the Philippine side would be pleased about it. Since last October, China-Philippine relations have been turned around and put on a track of all-around improvement, creating a favorable political environment for the people-to-people exchanges between the two countries. Friendly interactions between the two peoples have been greatly boosted, which will in turn help enhance mutual understanding and trust, make the public foundation for good neighborliness and friendship more solid, and gather strength for the sound and steady development of China-Philippines relations. As you can see, China and the Philippines recently have been interacting with each other quite frequently, with good news popping up all the time. Two days ago, President Duterte was here for the BRF, during which he had good meetings with Chinese leaders and cooperation documents covering the fields of economy, technology, infrastructure, human resources, energy, press and publication were signed. Yesterday, Speaker of the House of Representatives of the Philippines Pantaleon Alvarez began his visit to China for parliamentary exchanges at the invitation of Zhang Dejiang, Chairman of the Standing Committee of the National People's Congress. 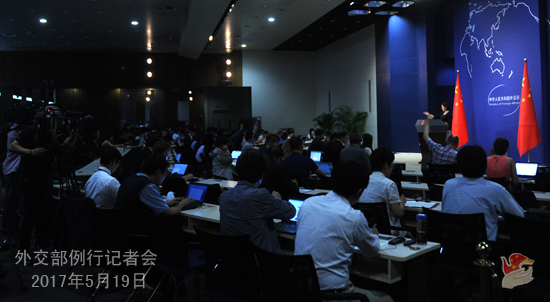 The first meeting of the China-Philippine bilateral consultation mechanism on the South China Sea issue is also underway in Guiyang where the two sides will have friendly dialogues and consultations on the South China Sea-related issues. I believe that continuous and deeper practical cooperation between China and the Philippines will bring more tangible benefits to the two countries and peoples. Q: The US military said the two Chinese Su-30 fighter jets intercepted a US surveillance aircraft in international airspace above the Yellow Sea. The US side claimed that at one time the US plane was only 45 meters apart from the Chinese plane, and that the maneuver of the Chinese side was unprofessional. The two sides are trying to resolve this case through diplomatic and military channels. Can you confirm? What is your response to their statement? A: I am not aware of the situation you mentioned and would refer you to the Defense Ministry. Q: First, President Putin expressed support for the Belt and Road Initiative after coming to Beijing. He is holding an international economic forum early next month in Saint Petersburg. In China's view, how important is Mr. Putin's international economic forum? Do you see any common points between Russia's economic strategy and China's Belt and Road Initiative? Second, is China concerned about the controversy over the alleged Russia's involvement in the US elections? Do you think it will affect President Trump's ability to handle foreign policy challenges in general? A: On your first question, the Saint Petersburg International Economic Forum is a well-known one focusing on major issues like the world economic and financial circumstances. China and Russia have the fine tradition of supporting each other's major events. China has been attaching importance to and supporting Russia's holding of the Saint Petersburg International Economic Forum. In recent years, we have been sending high-level delegations to the forum. We will do the same this year. We also support capable and influential enterprises and business people in actively participating in the activities under the forum framework. We believe that the Saint Petersburg International Economic Forum will become a rewarding platform for the two sides to enhance practical cooperation. As for the common points between Russia's economic strategy and China's Belt and Road Initiative, in May, 2015, China and Russia reached a strategic consensus on aligning the Belt and Road Initiative with the Eurasian Economic Union (EEU), which has won positive response and support from other members of the Union. For the past two years, relevant alignment work has been carried out in a steady manner with remarkable progress. In the next stage, China would like to work with Russia to continue moving forward the alignment cooperation so that more practical results can be achieved. We would also like to strengthen practical cooperation with the EEU to get more alignment projects up and running. As for your second question which belong to the domestic affairs of the US, I have no comment. Q: The Japanese government said that Japanese fighter jets were scrambled over Diaoyu Dao after the Chinese Coast Guard ships which were patrolling around it apparently set up a drone. They said they have submitted a diplomatic complaint to the Chinese Embassy in Tokyo. Do you have any details as to what this drone was doing? What response has the Chinese side given to the Japanese side? A: First, I want to correct something of what you said. We have learnt that the drone was used by relevant media for aerial photographing, not some kind of military activity as hyped up by individual foreign press. But I would like to stress again that Diaoyu Dao and its affiliated islands are China's inherent territory. It is our inherent right to organize the Chinese Coast Guard vessels to conduct normal patrols, law enforcement and relevant activities. As for the so-called representation or complaint made by Japan, of course we will not accept it. Q: Taiwan is not invited to attend the WHA, but is still planning to send a delegation led by its "Minister of Health" to Geneva, Switzerland. They plan to hold a press briefing to the foreign media, submit written complaint letter to the WHO, and hold bilateral or multilateral talks with some countries' representatives. What is your comment? Will China obstruct such plans or even ask Switzerland to deny their entry? A: On Taiwan's participation in activities organized by international organizations, we have made our position clear on many occasions. I would repeat here that the WHO is a specialized agency of the United Nations made up of sovereign states. It must adhere to the One China principle as embodied in Resolution 2758 of the UN General Assembly and Resolution 25.1 of the WHA. Taiwan is a part of China. Its participation in activities organized by international organizations must be handled in strict accordance of the one China principle. The refusal to acknowledge the one China principle by the authority of the Democratic Progressive Party (DPP) is the fundamental reason why the special arrangement which enabled Taiwan to attend the WHA for the past eight years cannot be sustained. It is simply easy to see whose responsibility it is. We have noted the situation as you said. We believe that whatever the DPP authority plans to do will only end in one certain result-failure. Q: You mentioned that today was the first meeting of the bilateral consultation mechanism between China and the Philippines on the South China Sea issue. Could you tell us more? What specifically is China hoping to achieve from this meeting? A: The establishment of the China-Philippine bilateral consultation mechanism on the South China Sea issue is part of the consensus reached between the two leaders during President Duterte's visit to China last October. This January, the two sides agreed to officially set up such a mechanism during the 20th bilateral diplomatic consultation. They decided to build this mechanism into a platform for the two sides to establish confidence-building measure and promote maritime cooperation and security. The mechanism is at vice foreign ministerial level. The two foreign ministries and departments in charge of maritime affairs send the same number of officials to attend meetings which will be held alternatively in China and the Philippines every six months. The first meeting that is underway in Guiyang this afternoon is co-hosted by Vice Foreign Minister Liu Zhenmin and Philippine Ambassador to China Romana. The purpose is to implement the important consensus reached between the two leaders last October and formally launch this mechanism. We hope and believe that the two sides will have friendly, candid and in-depth communication and dialogues on maritime issues, pool together consensus, promote mutual trust, properly deal with disputes, move forward maritime practical cooperation, create conditions for the settlement of the relevant dispute, and cultivate a favorable atmosphere for the sustained sound and steady development of bilateral ties and smooth progress of all-around cooperation. Q: India and Singapore are said to hold navy exercises in the South China Sea. What is your reaction to that? A: We have no problem with it if such exchange and cooperation is normal, out of friendly purposes, and conducive to bilateral relations and regional peace and stability. Meanwhile, when engaging in such exchange and cooperation activities, relevant countries should mind not intentionally hurting other countries' security and interests and not negatively affecting regional peace and stability. Q: Today, President Xi Jinping met with Special Envoy Lee Hae-chan of the ROK President. Did they mention when the leaders' meeting would be held? A: We have released relevant information on the meeting between President Xi Jinping and Special Envoy Lee Hae-chan of the ROK President. As for when there will be a leaders' meeting, I have no information on that. President Xi said that China values its relationship with the ROK and would like to work with the ROK to preserve the hard-won outcomes of bilateral ties. On the basis of mutual understanding and mutual respect, the two sides should consolidate political mutual trust, properly deal with disputes, and move China-ROK relations back to the normal track at an early date for further improvement and development. Special Envoy Lee Hae-chan said that bilateral relations have register fast growth over the past 25 years of diplomatic ties. There are vast potentials and bright prospects for bilateral ties. The ROK side fully understands China's major and legitimate concerns, and would like to step up communication and coordination with China and seek a proper solution to the issue obstructing the development of bilateral ties. We hope that Special Envoy Lee Hae-chan's visit will create favorable conditions for the two sides to properly address disputes and move forward the improvement and development of bilateral relations. Q: The rate of the Chinese and US aircrafts coming close to each other at a dangerous level seems to be increasing. Are there any steps that the Chinese government will take to decrease these events? A: Regarding the close-up encounter between the Chinese and US military planes asked by the "Central News Agency" of Taiwan, I've said that I have no information and I need to check with the Defense Ministry before making any comments. But as we said before, for a long time, the US vessels and planes have been carrying out close-up surveillance on China, which is highly likely to cause misunderstanding, misjudgment, or emergencies on the sea or in the air. We hope the US could respect China's legitimate security concerns. Q: Special Envoy Lee Hae-chan of the new ROK President Moon Jae-in visited China and met with Chinese leaders. Does this signal a trend of improving ties between the two countries? Did China mention the THAAD issue? A: The fact that President Moon Jae-in tasked his Special Envoy Lee Hae-chan to visit China for talks soon after he took office shows the importance the new ROK government attaches to its relationship with China. China would like to work with the ROK to improve and develop bilateral ties. As for the THAAD issue, China's position is very clear. 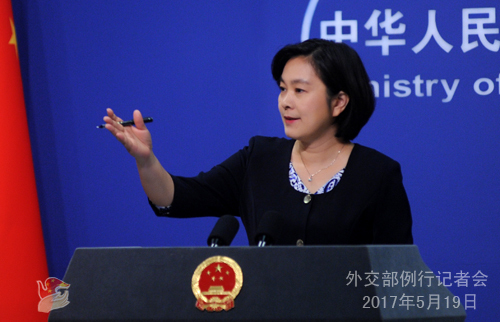 During Special Envoy's visit, China once again expounded on its principled position on the THAAD issue, asking the ROK to properly address the major and legitimate concerns of China. Special Envoy Lee Hae-chan said that the ROK is aware that the THAAD deployment has caused damage to mutual trust and exchanges, fully understands China's relevant major and legitimate concerns, and would like to step up communication and coordination with China and seek a proper solution to this issue with all sincerity. 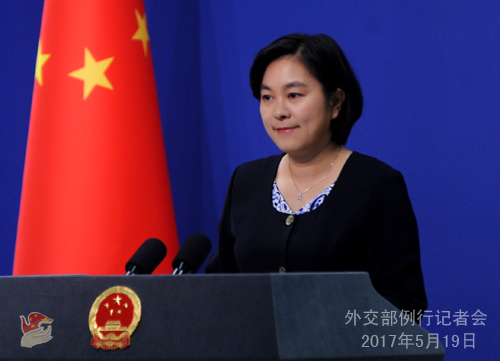 Q: China and ASEAN member states reached a framework of the COC on May 18. Could you give more details? What is the significance of it? A: The 14th Senior Officials' Meeting on the Implementation of the DOC held by China and ASEAN member states in Guiyang yesterday adopted the COC frame. The two sides had previously planned to reach such a framework by the mid of this year. Now, thanks to the concerted efforts and highly efficient and pragmatic work, the goal was reached in advance. The COC framework is a document that is comprehensive and accommodates the interests and concerns of all parties, with the structure of preface, goals, principles, basic pledges and final clauses. It is fair to say that as an important outcome of the current stage of the COC consultations, the framework will play an important role in enriching and improving regional rules and lay a solid foundation for the next-stage consultations on the COC. The DOC was signed 15 years ago, representing a consensus of all parties to enhance mutual trust, promote cooperation, and jointly preserve peace and stability in the South China Sea. For the past 15 years, China and ASEAN member states have been implementing the DOC mechanism, overcoming disturbances, and jointly safeguarding peace and stability and economic prosperity of the South China Sea region. The DOC mechanism has become one of the main platforms for all parties to preserve stability and promote cooperation of the South China Sea. The COC is an extension and development upon the DOC. We would like to work with ASEAN member states to continue with the strict implementation of and full compliance of the DOC, uphold the principle of mutual respect and decision upon consensus while moving forward consultations, endeavor to reach the COC at an early date and jointly maintain peace and stability in the South China Sea region. Q: An official from the ROK said on May 18 that US Secretary of State Rex Tillerson said during a meeting with the ROK's Special Envoy to the US, Hong Seok-hyun that the US meant it when it said it seeks no regime change, no invasion and it will guarantee the DPRK's social system. The DPRK shouldn't inquire about the US intentions "through back channels". Tillerson said that Pyongyang should refrain from conducting nuclear or missile tests so as to create the right atmosphere for talks. The DPRK should seize the opportunity and trust the US. What is your comment? A: We have noticed that in recent days, the US, the DPRK and the ROK have all sent forth messages signaling their willingness to resolve the issue through dialogue and consultation. We believe that these positive signals deserve serious thoughts by all relevant parties. As parties directly involved in the Peninsula nuclear issue, the US and the DPRK should made political judgments as soon as possible, showcase sincerity, and make constructive efforts and take concrete actions for the early resumption of dialogues. We also noticed that both the US and the DPRK said that dialogues need proper atmosphere or conditions to happen. We believe that under the current circumstances, responding to the most pressing concerns of all parties will help find a breakthrough for the resumption of dialogues. The suspension-for-suspension proposal China advocates is to put in place conditions for the difficult but meaningful first step to happen. The dual-track approach which realizes denuclearization and establishes a peace mechanism for the Peninsula in parallel addresses the security concerns of all parties in a balanced way and leads to long-term stability on the Korean Peninsula. We hope that all relevant parties could give serious thoughts and make positive response to China's proposals. Q: Has there been a date set for the next meeting with the Koreans? A: China maintains close communication and contact with all six parties to the Korean Peninsula nuclear issue.